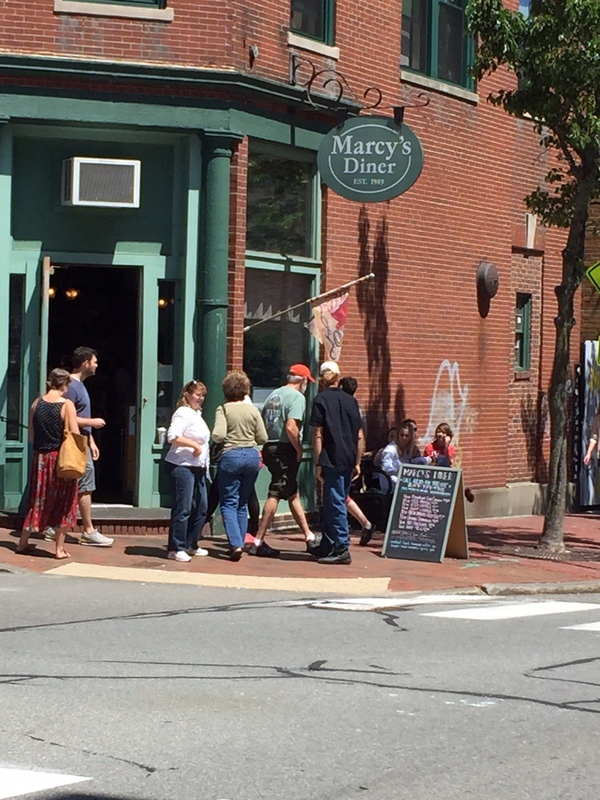 We live in Portland, Maine home to the much debated encounter on social media surrounding something that happened on July 18th between Darla Neugebauer, the owner of Marcy’s Diner, who may or may not have a anger management problem and customers, Tara Carson and her husband, who may or may not be horrible parents to a toddler who may have been either “screaming” or “crying”. Both sides have weighed in: Carson on Marcy’s Facebook page to which Neugebauer responded in a profanity ladened post which has since been removed. Then Neugebauer was interviewed by our local NBC affiliate station which was soon after shown on The Today Show among other programming. Not to be outdone Carson just hours ago published a rebuttal post on the Washington Post no less. What I know for sure is the truth of the matter is murky and unreliable. I know that the debate ignited a powder keg of animosity on the duties and responsibilities of parenting, the nature of children and ladies who yell at other people’s children. More locally– the comment section of The Portland Press Herald’s story regarding Neugebauer’s assessment of the incident reveals the simmering class resentment that pervades some Mainer’s view of tourists in general. Carson is not helping “people from away” by being from New York or publishing on the Washington Post. The only thing that could have made it worst was publishing it on The New York Times. Vacationland Be Damned! And, honestly, I could care less about all of it save one thing. I am delighted to no end the toddler in question was not a “special needs child” or a “Down syndrome child”. Children with disabilities particularity cognitive challenges take a real hit on social media when it comes to scrutinizing their behavior in restaurants– and everywhere else in the world for that matter. These stories often go viral along with all the ugly comments written by haters as if they were facts about children with disabilities rather than the disseminating of repugnant stereotypes. I am confident Darla Neugebauer will weather this storm as a business owner, Tara Carson will be on The Today Show by next week, her toddler will not be scarred in the least by this incident and “people from away” will not be dissuaded from coming to Maine in the summer. The same could not be said if at center stage the child in question had a cognitive disability. It would be one more instance of punishing judgement for that child which would translate to the whole contributing to the ignorance, discrimination and exclusion of children like my son. This entry was posted in Darla Neugebauer, Down syndrome, Maine, Marcy's Diner, Portland, Tara Carson, Washington Post and tagged Downsyndrome, Maine, Marcy's Diner, Portland, Tara Carson, Washington Post by Kari Wagner-Peck. Bookmark the permalink. Good point. I’ve read a few versions of the article and, like you, I get the impression the focus was on a mix of bad parenting and an over reaction by the owner. My sympathy lies firmly with the child who got the worst of both events: being ignored and being shouted at. My son has a cognitive disability and can be loud when we take him out but we have ways to distract him and will remove him if he gets distressed. Oh yes. Hidden cameras. How would you react, viewer?